In this article we will tell you some important information about planting cannabis seeds in a hydroponic system or in soil. 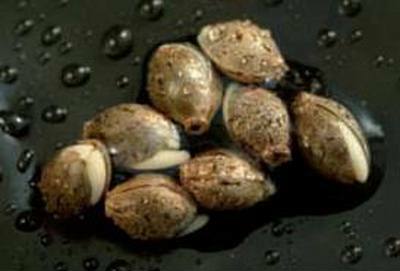 Sprouting marijuana seeds is an easy process. We will teach you how to do everything right. Your tools must be clean. Wash them with anti-bacterial soap. Don\’t walk in the woods before planting the seeds as you can have bugs on your clothes or hair which may be dangerous to your seeds. Humidity is very important for sprouting seeds. It must be about 60-70%. In the following we will tell you about planting seeds in hydroponic system and in soil. There are many similar tips, except for some minor points that have to do with the specific medium. The best medium to start the seeds is rockwool cubes. You can use pre-cut rockwool cubes, or you can cut it by yourself. Cubes should be 1 inch thick and 2 inches tall. Put the cubes in small cups with holes for drainage. Then you should make a hole in the top of each cube. The hole must be wide enough to drop a seed in. Water the cubes thoroughly. Drop one seed per hole. Put the cups under 40 Wt fluorescents lights. The lights must be 2-3 inches above the cubes. The warmth emitted by the lamps will facilitate sprouting. The lights must be on all day and night. Room temperature must be about 90 F. You can use a heating mat if necessary. Your seeds will sprout in several days. After the seeds sprout, make sure the lights are high enough. At this stage, they grow very fast and need more room. You will see the roots through the bottom of the rockwool cube in 3-5 days. This is the best time for transplantation. Cut out a space in a bigger slab of rockwool. Water the rockwool thoroughly. Use warm water. Be careful taking the rockwool cube out of a cup. Don\’t touch the roots! Place the cube into the hole that you cut out in the big rockwool slab. Make sure that the small cube sticks out a bit. This prevents stem rot. Now you can use nutrients. Add nutrients to the water. You can buy special mixes for seedlings or use just half the dosage. Transplanting plants to a different medium than what they are used to will give them a shock! For marijuana seeds you can use peat cups with the same soil mix that you will use later after transplantation. The roots of the seedling will grow through the cup. It is very convenient as you won`t have to remove the cup during transplantation. Water the cup thoroughly. Let the excess water to run off. Make a small hole in the top of the soil to drop a seed in. Place one seed per hole. Wait until the excess water runs off. Check the medium every day. If it feels moist to the touch, it is moist enough. If it feels dry, water a little. Make sure the excess water runs off. Use warm water. Cold water may shock the sprouting seeds. This shock may cause the stress and delay sprouting. Do not use any nutrients now! Only plain, warm water. You will see the roots through the bottom of the cups in 3-5 days. This is the best time for transplantation. Fill a pot with the potting mix. Water it thoroughly. Let the excess water runs off. Use warm water. Prepare a hole in the middle of the pot. Place the cup in there. Transplant carefully! Don\’t touch the roots! Place the cup into the hole in the pot. If the hole is too small, don\’t press the cup into the hole. Just make it bigger. Watch out! Stem rot might occur if water forms a puddle at the base of the stem.